From younger days I remembered the exotic name of Ceylon. Now called Sri Lanka, the new name sounds equally tropical and exotic. I have always wanted to visit and now I combined a visit with inspection of tours and hotels to offer our clients. We started offering tours to Sri Lanka last year, and several of our clients took our 14 day Sri Lanka Ancient and Modern tour. We wanted to do the same itinerary ourselves to test it out, inspect hotels and make improvements where possible. My business partner, Rob, and I arrived at Colombo airport in the early afternoon on Saturday 19th April and were met by our guide and driver for the next 14 days. In India and Sri Lanka all our private tours for parties less than six people are guided by one person acting as both driver and tour guide. This is very different to our tours in other countries where we have a driver and a separate tour guide. Clients who have travelled with us to Indochina may need to adjust to this type of combined guide/driver tour. According to our itinerary, we did not start our tour in Colombo but instead drove straight away to the town of Habarana. The journey takes aboutm four hours, along decent roads with lovely rural scenes of villages and countryside greenery. Our driver would stop the car occasionally to point out birds and types of fruit trees to us. We saw kingfishers and many exotic fruit trees on the way. He also bought us king coconuts (yellow in colour) for the natural drink inside. It tasted good and we enjoyed it again many times during the next fourteen days. To break the four-hour long drive, we stopped in Pinnawala according to the programme to visit the famous Pinnawala Elephant Orphanage. This centre was created originally to protect and care for the abandoned or orphaned elephants. Now the centre has turned into more of a kind of zoo with many commercial stores and restaurants for visitors and tourists. Although it is a welcome break for the journey we have decided to take out this visit from our programme. 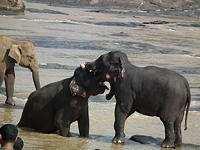 There are many more chances to see elephants in the wild later in the trip. We arrived at Habarana in the late afternoon and checked in to the Cinnamon Lodge for two nights. We use this hotel in our deluxe hotels category. We were certainly not disappointed with the hotel. 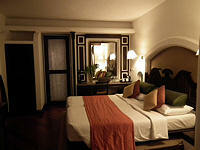 Our room was large and divided into an entrance/sitting area with chairs and a sofa, the bedroom and a large bathroom. There was a nice patio outside the room with two reclining chairs with a lovely view of the gardens. Our room was on the ground floor and there was one room above, together in a two-room house. 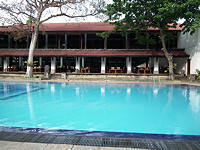 The swimming pool is the best feature of the hotel, large and rectangular, running the length of the restaurant. 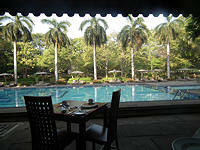 It is most pleasant to sit at one of the tables on the patio next to the pool for breakfast or dinner. At breakfast, birds and squirrels join in along the swimming pool. Sometimes there are monkeys too but they are normally shooed away by the hotel staff. This hotel has become one of my favourites in Sri Lanka because of the excellent restaurant service and the quality of the food on offer. The international buffet on our first night was exceptional with the best raw salmon fillet Japanese style that I have ever tasted. It was soft and tender like jelly. I also had the best roti (local pancake-style flatbread) because they made it at the restaurant in front of you. I thought that dinner was the best until next morning when I had some Sri Lankan fish curry with French bread for breakfast and it was sensational. I went back twice for the fish curry and ignored all the other delicious looking food on display.